DNS stands for “Domain Name System”, which is a system used to translate the word-based addresses to the numerical IP (Internet Protocol) address. 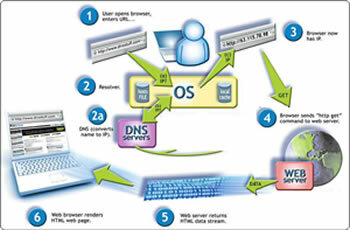 DNS is an acronym for Domain Name System or Domain Name Service. It was introduced by Paul Mockapetris and Jon Postel in 1984. It is an Internet or other network server, which converts the domain names or hostname to their associated IP addresses. It translates the word-based addresses of systems such as, www.example.com to the numerical IP (Internet Protocol) address such as the 192.0.43.10 of the computer or system. A DNS distributes the responsibility by assigning and mapping the domain name to the respective IP addresses. It designates the authoritative name server to the each domain. DNS also distributes the responsibility of assigning the domain names, and maps those names to the respective IP addresses by designating the authoritative name servers of each domain. The DNS mechanism provides the distributed and fault tolerant service, and was designed to avoid the need of a single central database. DNS helps in the specification of the technical functionality of a database service. It defines the DNS protocol, which is a detailed specification of the data structures and data communication exchanges used in DNS, as a part of the Internet Protocol Suite. A DNS (Domain Name System) maintains the domain name in hierarchy. It also provides the translation of services between the domain and it's address spaces. A DNS is implemented by the Internet name servers and the communication protocol. A DNS name server, is a server that stores the DNS records for a domain name, such as the addresses like A or AAAA records, name server NS records, and mail exchanger MX records. It also responds to the queries against the databases. Domain name space: A domain name space consists of a tree of domain names. Domain name syntax: Domain name syntax consists of one or more parts, technically called labels that are conventionally concatenated, and delimited by dots, such as example.com. Internationalized domain names: The Internationalizing Domain Names in Applications (IDNA) system converts the user application, such as web browser and map Unicode string into the valid DNS character set using Punycode. Name servers: The nodes of the distributed database system of the client-server model maintain the databases into the name servers. Authoritative name server: An authoritative name server is a name server that gives configured answers to the original source, for example, the domain administrator.